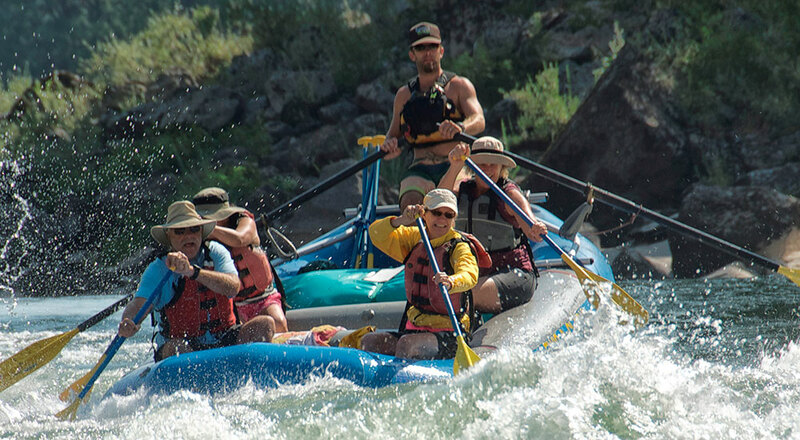 Our Idaho rafting vacation trips have charisma. We can easily list its attributes; accessible whitewater, rugged beauty, vast white sand beaches, warm & dry climate, but beyond the obvious there is feeling you get while floating, paddling, hiking, and for a few days living on the Main Salmon. 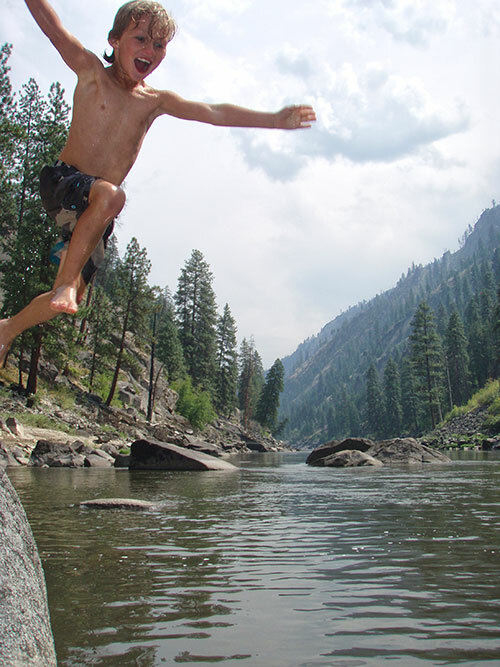 Like a true charismatic, the Salmon River may influence you to… go for a hike, try an inflatable kayak, build a sand castle or just relax in a way only possible when you are away from phone & computer. It’s that same feeling that draws our clients and guides back to the Salmon River to live for few days in this wilderness paradise. The free-flowing Salmon River flows 120 miles through the largest contiguous wilderness in the lower 48 states, and much of it is the same as the day that Lewis and Clark investigated it as a possible route west. They decided the rapids were too rough for their expedition, but our guides are ready and more than able to help you negotiate the rapids and share their knowledge of the abundant wildlife, plants, geology and the history that lives where the Salmon River cuts the second-deepest canyon in the lower 48 states. From an oar boat, to a smaller self-bailing raft, even an inflatable kayak for the more adventurous. No matter the mode, when you reach camp, you will find that you have time to fish, hike, swim, or just enjoy some relaxing time in one of the most beautiful spots in the world. And while you kick back, a healthy and hearty dinner is prepared, in anticipation of a cozy night under the stars. The Salmon is a great destination for families looking for adventure on one of the United States’ great rivers. Lewis & Clark Trail Adventures knows that much of your experience relies on the personality and expertise of your guide. Rest assured, our guides know how to show you a good time, beginning with a river & camp safety briefing prior. LCTA guides are like family and after a few days on the river, you’ll feel more like part of our family than a guest! We take pride in our camp cuisine. Meals should be something you look forward to and exceed your expectation right up until the last day. Start your day with a good cup of coffee and a hearty breakfast like pancakes & sausage with fresh fruit & juice, lunch is welcome stop with sandwiches made with quality deli meats & cheese, lots of fresh veggies & snacks, dinner might be marinated & grilled flank steaks, colorful salads, Dutch oven deserts and bread from local bakeries. Beer and wine, in moderation, is provided with appetizers & dinner. Water, sodas, and gaterade also provided. We are happy to accommodate various dietary needs so let us know your requests. The gear is designed with your comfort in mind. The following items are provided on our standard trips. Beverages including drinking water, Gaterade or sparkling water and/or soda. Beer & wine in moderation 2 per person. If you are going on a custom trip with either upgraded amenities or discounted trip, the above provisions may vary. Brendan Leonard, adventure writer and master of unconventional / modern literary arts, will lead this unique writing workshop on the Main Salmon River, through the heart of the rugged Idaho wilderness. Final rate per person depends upon group size and provisions. Please contact us to confirm availability before booking your trip. The most complete multi-day kayak instruction available. 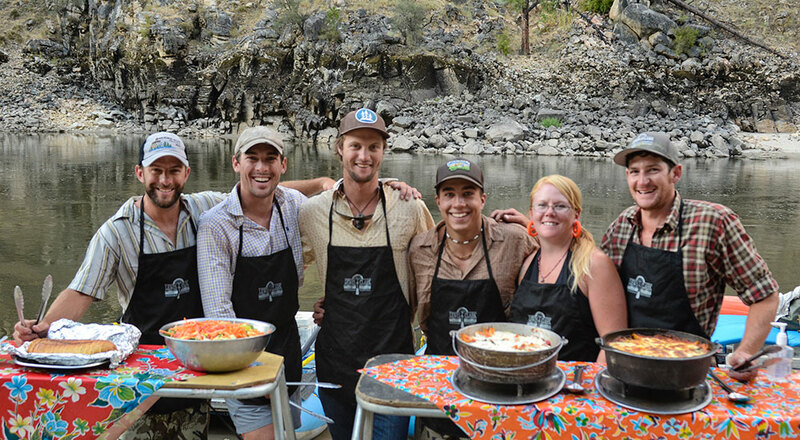 We provide a professional whitewater guide, all river gear, camping equipment, healthy & hearty camp cuisine, transportation to and from the river. Some trips have special themes or different provisions & transportation logistics so be sure to check with us regarding your trip. 3 & 4 day trips are possible with fly-out + optional Wilderness Lodge overnight stays. Need trip insurance? For your convenience, we offer travel protection through Travelex Insurance Services. For more information on the available plans or to enroll, got to www.travelexinsurance.com or contact Travelex Insurance Services at 800-228-9792 and reference location number 26-0048. Contact us with any questions or to make your reservation, we are ready to help you plan your trip! "The water is so rapid and the bed of the river so rocky, that going by water appeared impracticable; and the mountains so amazingly high, steep and rocky, that it seemed impossible to go along the river by land." © 2019 Lewis and Clark Trail Adventures Lewis & Clark Trail Adventures (LCTA) is a licensed service partner with the USDA Clearwater and Salmon National Forests, Bureau of Land Management, and Fish, Wildlife & Parks. We are members of the Idaho Outfitter and Guides Association.